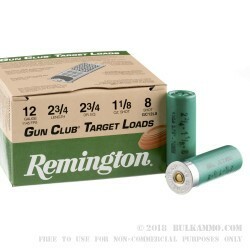 This 250-round case of Remington Gun Club 12ga target loads is a great way to get the most out of your shooting budget. These 2 3/4" polymer shells are reloadable, so the value doesn't stop with your first round of shooting. This 12ga Gun Club ammo features Remington Premier STS Primer that will ignite the powder load and prompt a quick, powerful release from your 12ga shotgun. 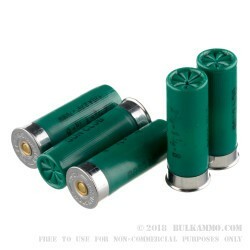 These shells are filled with 1 1/8 ounce of #8 shot that will destroy clay pigeons and ravage targets. 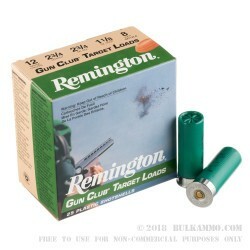 Remington Gun Club ammo is the perfect practice ammo to help you prepare for your next big hunt. Remington's rock solid reputation as a premier American ammo and arms manufacturer began over 200 years ago. These 12ga shotshells live up to the Remington name, and you'd be hard-pressed to find a better practice round for the price. 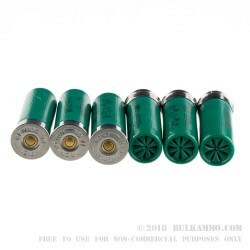 Order your 250-round bulk case today! Q: What is the average muzzle velocity? A: These are 1145 fps.